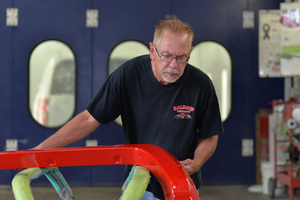 The past 30+ years we have been in business have been full of honest hard work and respect for our customers in Butler, PA. Baldauf Auto Body knows that when customers damage their vehicles, they need a shop they can depend on to get the job done right. Our highly trained professionals working out of our 20 bay facility are experts in their fields and are waiting to help you. They are capable of performing any sort of body services such as paint jobs, scratch removals, dent repairs, window repair/replacement and other collision damages. Our large, clean facility is equipped not only with experts, but also state of the art technology allowing us to be super precise when working on our customer’s vehicles. We have technology such as our Elektron aluminum/silicon bronze welders, Chief self-piercing rivet guns, Tecna resistance spot welders, a certified PPG Envirobase waterborne paint facility, a Chief Laser frame measuring system and many more. These tools are what help us help you in the best way possible. 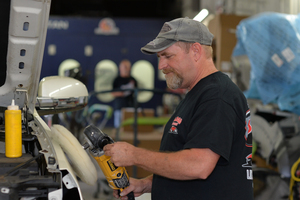 Our mechanics and technicians are honest workers who are more focused on performing quality work rather than getting the job done easily. We here at Baldauf Auto Body make sure to always place our customers best interest as a priority. We know that when car mishaps occur, customers are stressed and often do not know what to do. It is for this reason that we make sure to make our services as easy and stress-free as possible. When you come to see us for bodywork, we are 100% committed to our goal of returning your vehicle back to its original condition. We do all this in a timely manner and with the utmost care. Come bring your vehicle in today, and get it looking as good as it should be. Once we receive your vehicle, we will keep you updated on its progress via your choice of email, text, or a simple phone call. These are just a few ways we do our best to make sure that our family of customers receives the best auto care around. By providing quality services, it is no surprise that our community has supported us throughout the years. We believe we provide the best service around Butler, PA and feel confident you will soon know too. We are committed to our mission and hope to bring you the joy we have already brought to hundreds of customers. In fact, we have done such a swell job that even the local Butler County Ford dealership recommends our shop to repair the aluminum F-series trucks. This is all thanks to honest hard work and community support. Come to see us today at 59 Pittsburgh Rd Lyndora, PA. If you can’t make it into our shop, gives us a ring at (724)-283-5554 or contact us online for your next auto body repair.